At the beginning of the summer I always vow that we will dedicate a portion of time to keeping up on our school related skills. We usually start off with a bang, but then the fun gets in the way. To be honest, I am sort of okay with the fun taking over. Summer is really special to me. You don't get very many of them with your kiddos and even fewer that aren't interrupted by sports or other peoples plans or things they would rather be doing. But as school starts to draw closer I always feel a tiny tinge of guilt and we spend some time reviewing things they should know before they head back to school. I love when I can find free printable worksheets for the kiddos to work on and when I saw these cute alpahbet tracing pages over at UCrate today I knew they would be perfect for my youngest to work with. And the best part (other than the fact that they are cute AND free) is that the entire alphabet is included. 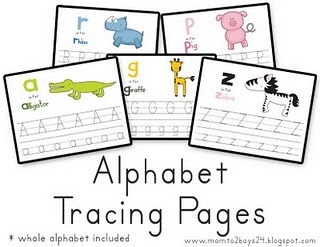 You can download these free alphabet tracing pages over at Lawteedah. With my youngest starting his last year of college, our home schooling days are long over, but I do well remember the fun and pride taken from these kinds of sheets. Perfect! I have three little guys who could stay very busy using these sheets! Awesome! Thank you so much for sharing these. They will come in handy when teaching my 4 year old.